I'm on Blab. My handle is @dnewman. You should add me, and I'll tell you why in a second. Frankly - I believe Blab will change how you interact with your fans, prospects, and customers for the better. But at first, I thought it was the dumbest thing in the world. Another fad or shiny object. "Who cares about Blab?" I asked a few weeks ago. Here's a link to my very first Blab broadcast - Episode #000 - coming up TODAY 4/29/16 at 10:30am Eastern so you can hop on and get a feel for what it's like. And YOUR fans, prospects, and customers can tune in to watch you on video, and interact with you (and other people watching), LIVE. At first, I thought this was stupid. Who would watch some rough, off the cuff, badly lit live video with a bunch of nerds sitting around in their basements? In fact, for my first Blab at 10:30am Eastern today (linked above) I am co-hosting with the amazing Catherine Bernard and there will be open seats for YOU to join us via live video, just using the webcam built into your laptop or phone. So we scheduled this for 10:30am today. I had my doubts. I mean, would anyone actually show up? Who would show up for a broadcast with very little notice? People schedule teleseminars and webinars in their calendars days and weeks ahead and they can't even show up to those. Why would they show up to this? 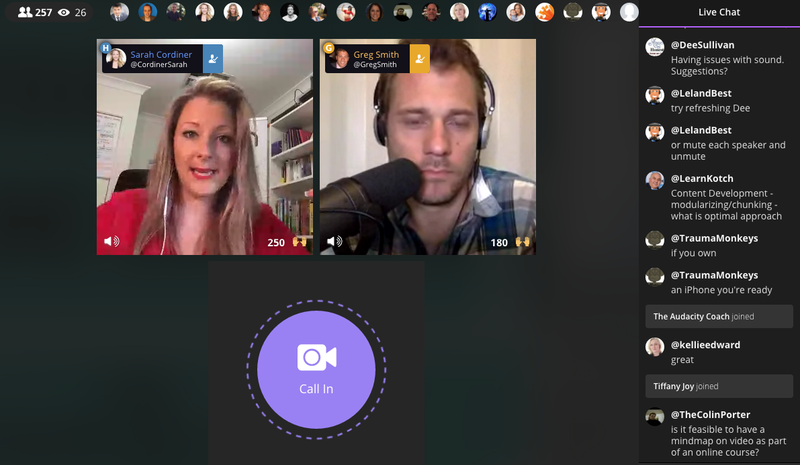 Captain obvious here - it turns out that not only do people show up, they actually LOVE taking part in live video on Blab. Because it's a conversation platform - NOT a broadcast platform. And that's why I believe this is a GAME CHANGER for speakers, authors, coaches, consultants and thought-leading professionals who are looking to grow their business. Plus - right now, it's early. Have you ever had the thought, "I sure wish I had started my business when..."
Well, now's the time. Blab is less than a year old, and YOU can be one of the first few people who do it in your industry or niche. You can watch it on the web, on a link like this, or you could download the app on your iPhone and interact, and get notifications when a Blab goes live. I suggest you join here - www.blab.im or download the app now. And I suggest you follow me @dnewman. For the next few months, I'll be "Blabbing" regularly — "Blabbing" is what the cool kids call going on Blab - and I'll share all-new training material that you won't be able to get anywhere else. Totally free. Then I've got some cool things lined up for you about how to get more speaking gigs, how to write killer copy that converts, how to grow your email list, how to write and monetize your first (or next) book, and how to maximize your influence, impact, and income as a thought-leading executive or entrepreneur. To ensure you don't miss these, go add me on Blab right now. My handle is @dnewman. That's all for now. "See" you at 10:30am Eastern this morning. And if you're feeling brave, click the "Call in" button when you see it onscreen and hop in to join us via live video!! As a marketing speaker and marketing coach, I've noticed that my clients and audiences are always fascinated by the topic of business blogging - specifically blog writing. How can you write so much? Do you REALLY post a new blog every day? Where do your blog ideas come from? Do you do your own writing or do you have people that blog for you? How do you know what to put on your blog and what to put in your email newsletter? This week, we'll dig into Business Blogging 101 and you'll master the basics of business blogging. So stay tuned and please DO use the COMMENTS area of the blog to share your own blogging advice, insights and recommendations.